After the samadhistha (state of absorption in samadhi) of Ananta Shri Vibhushit Jyotishpithadhishwar Jagadguru Shankaracharya Brahmibhut, Swami Brahmanand Ji Saraswati, disciples have been reading many things in the papers in connection with occurrences taking place, so it is very natural for them to become anxious. For the circle of anxious disciples to understand the reality and to prevent suspicion, it is necessary for this article to be published. Brahmibhut Shankaracharya Swami Brahmanand Ji Saraswati’s own physical leela, devoted to spiritual accomplishment, performed pranayama at midday on 20th May 1953 in Calcutta, and afterwards Their worldly body was brought to Kashi (Varanasi) by rail. 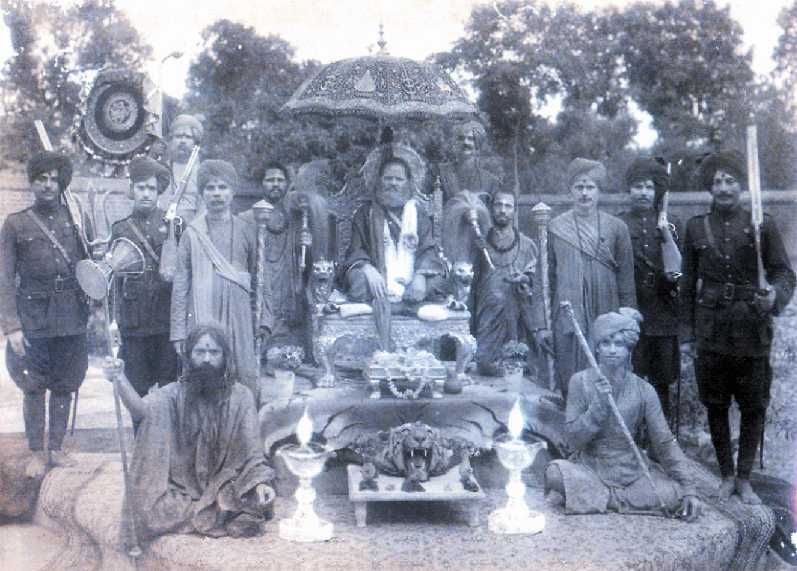 News that Maharaj Shri had become brahmibhut (merged with brahma) was relayed to principal disciples in various towns by telephone and telegram. Consequently, numerous disciples - female and male – quickly arrived at Kashi by rail, motor car and airway. The body of Acharya Charan arrived at Mugalsaray Station, was placed in a motor car, and taken to Brahmanivas Ashram. From daybreak, really the community was onhand seeking darshan. At the sight of the material body of Maharaj Shri a large wave of mourning pervaded. Discordantly, many women, men and children cried. In the room of Acharya Shri’s regular residence, Their body was duly washed etc, decorated with sandalwood and fresh raiment, and afterwards seated on a beautiful vimaan (bier). The entire community did a last pranaam to Bhagwan with flower garlands etc. Despite it having become merged with brahman for more than 30 hours, the face of Bhagwan was still seen to be of a brilliant appearance. The police band and another band of instruments played, and a gathering sung kirtan, behind which was the decorated vimaan of Acharya Maharaj on a motor truck. After their departure from Brahmanivas the crowd really grew. At Dashashwamedha Ghat it was as if everyone of Kashi, young and old, surged for a last darshan of Jagadguru. On the road to the Ghat there were all mankind. Many bajara (large roofed or covered boats) and dongee (small boats) afloat in Gangaji filled to the brim with darshan seekers continuously coming to the waterway. Having arrived at Dashashwamedha bathing ghat the ablution of Bhagwan was caused to done, and the vimaan was placed upon a huge bajara. On four sides were seated a circle of ascetics and a group of disciples doing kirtan (musical recitation). Whilst the bajara proceeded in the direction of Shri Kedar Ghat, many bajara and dongee began to encircle. On the shore of Ganga people collected at one place, and also swelled to the shores of Ganga Ji. Opposite Kedar Ghat, the earthly body of Jagadguru was seated in a stone casket, together with danda (wooden staff) and kamandalu (water pot), and placed in the current at the middle waters, samadhistha (absorbed in samadhi) in the very deep ocean of Ganga. Having observed this, thousands of followers had the experience of being forlorn and helpless. In this way it was for as long as 160 years, [until] the revival of Jyotishpeeth and the astikata (belief in the existence of God) in Northern Bharat (India), the awakening to righteousness. The one incomparable mass of light [now] was seen to have become hidden in the stream of Jahnavi (Ganga), together with the happiness of those religious folk supporting varnashram, and righteousness. Under the supervision of Swami Shri Karpatri Ji, an Interim Committee for the Arrangement of Jyotishpith was elected. 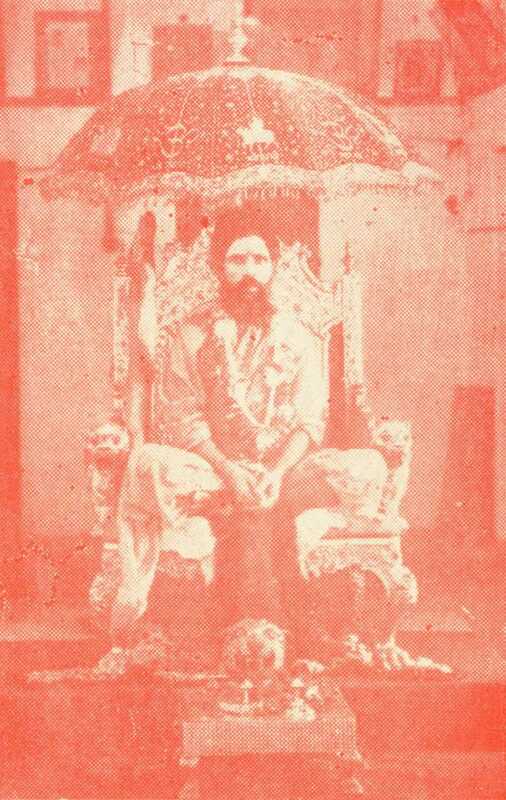 Swami Swaroopanand Saraswati, the President of the Committee and Pandit Balakrishna Mishra MA. LLB. principal mantri (chairman), and another 10 members were elected, of which were prominent disciples, ashram inmates, brahmachari and sanyasi. According to the settled custom, until 6th June were bhandara (feast given to sadhus), giving dakshina (donation) and food for Brahmans, the celebration of the festival of Basant (Spring puja), and the Pandit Sabha (Assembly of Pandits) etc. Actually, this then was known, that in Delhi, because a spectacular amount of effort, that Maharaja adjourned further upadesha (instructional) meetings in New Delhi. His tent was erected at the dwelling of number 7 Canning Road. He conversed with the Honorable President Dr Rajendra Prasad for about 80 minutes, and within a week he placed his antim vasiyat (Last Will and Testament) in a sealed envelope and it was placed securely with the Master Registrar of Prayag (Allalabad). Pandit Dwarika Prasad Ji, of endless service and disciple of Maharaj, was sent to Prayag to make the deposit, and Maharaja caused his First Will to be removed by him. This [new] Will was written in December 1952 and was deposited at that time. The Interim Committee obtained a copy of the Will from the Registrar’s Office, in which was written a perfect elaboration and explanation of the management of the Peeth (the seat of Shankaracharya), and in the Will was also the kram (series) of uttaradhikar (those who the inheritance would revert to). First of all, it is a description of founding and restoration of Jyotishpeeth, by the whole great righteous society of Bharat (India). After that it is about finding someone to install on thePeeth (seat) of Acharya, by way of the great sphere of righteousness of Bharat, and a description of entrusting of the land of Jyotish Peeth. After this, Jagadguru describes in detail about maintaining Jyotish Peeth, the school, the kitchen, the Shri Purnagiri Devi Ji temple and the installation of a statue, and the creation of a gopur (gate) and garden. The purchase of the kothi (mansion) from the Rajah of Dalipur, Brahma Nivas, located at Prayag (Allahabad) and a detailed description of the ashram at Jabalpur with the temples on the shore and ghats etc. of Narmada. Afterwards is a description of the organisation of those buildings in Kashi (Varanasi) constructed in holy memory of his own gurudeva - the description of the organisation of the ashrams, the school and the temple of Brahmaneshwar Mahadev Mandir. (4) Swami Paramanand Saraswati MA. Consecutively, one after the other to be Jyotishpeethadhish Shankaracharya. To the last, fourth acharya, is given the right to choose the future successor. Afterwards, all acharyas will have the right to choose their successors. In this connection is detail given that in the election of Jyotish Peeth parampara (succession), that he must be a dandi sanyasi, born a Panch Gauda Brahman in Bharat (India). This instruction was also given, that whilst a suitable dandi sanyasi of the Saraswati sampradaya is known of then they should be acquired, otherwise for successors of Jyotish Peeth, sanyasis of another ashram (hermitage) of a tirth (sacred place) etc. should not be made Shankaracharya [i.e. sanyasis of other ashrams should be chosen only in the absence of suitable candidates from the Saraswati line]. In the circumstance that the possibility of the series of Shankaracharya succession becomes severed, first of all one that is born in Bharat, in the disciple parampara of Saraswati, accepts varnashrama, virtuously follows dharma. And if a suitable disciple cannot be obtained of the Saraswati sampradaya (tradition), then this day pick an acharya of another ashram, of another tirth. In time, make all moveable and immovable property the acharya’s own, [but] to them is not given the right to take a loan or to take to their hand any other property by any means. Actually, to the Shankaracharyas of Jyotish Peeth are also consigned the management of several ashrams situated in Kashi (Varanasi). In connection with the vasiyat (Will), there have been erroneous false words printed in the newspapers. The correct news is this, that in the vasiyat are many pages of type, and and Maharaj Shri signed on each and every page, and at the end is the signature of eye-witnesses. The vasiyat had been inserted in a heavy envelope and enveloped in cloth, was stitched and all were enclosed in another envelope, and on that were attached seals. The hypotheses that the signatures of Maharaj Shri were obtained without his knowledge, or in a condition when he did not have the strength to notice, are completely baseless. The process of producing the vasiyat is dependent on the rule of the Registrar, according to which it had been produced. According to the determination of the aforesaid Interim Committee, on 12th June 1953, in Brahmanivas Ashram, completed as prescribed by the Scriptures, was the abhishek (installation) of Shri Swami Shantanand Saraswati Ji. Wise dandi sanyasis, town leaders, and a collection of disciples were in attendance. And according to the vasiyat, he is the Jagatguru Shankaracharya of Jyotish Peeth. Also, by Them is the management of the Peeth functioning. "Before today I wrote a closed vasiyat on 23-10-43 (23rd October 1943) and placed it securely with the Registrar gentleman in Prayag. Now, by way of this present vasiyat I refute and cancel the above-mentioned vasiyat. This new vasiyat, if I shall not get cancelled or exchanged in my own life, this then will signify my last vasiyat, and accordingly, afterwards according to this vasiyat will the management be done of Shri Jyotish Peeth and Shri Swami Krishnanand Saraswati ashram and the connected pathshala (school), Brahma Vidya Niketan and the mandir (temple) of Brahmanadeshwar Mahadeva. Therefore, together with earnest good consideration, without being influenced by opportune wilfulness or anything else, by way of writing my own vasiyat in this form, the parampara (succession) of Shri Jyotish Peeth acharya with stay uninterrupted, sanatana dharma (eternal dharma – i.e. Hinduism) and supporter of varna , the standing rule of Jyotish Peeth and clear aim of detailed instructions of the institution pertaining to Jyotish Peeth, the appointment of their own successor as Shankaracharya, and their duties, I am writing a detailed description of the suitable authority, also that settled to my own holy remembered gurudeva, the Shri 108 Swami Krishnanand Saraswati Trust, and the settlement and burden of arrangements of all the connected property, and by this vasiyat is consigned my own successor the parampara of Jyotish Peeth Adhishwar, by means of this above-mentioned vasiyat, management and adjustment, the first vasiyats having been terminated, this vasiyat is proved by my own signature, this is my very last vasiyat and it is really the chief obligation that I will protect my disciples.
' guru ke bachana prateeti na jehi . he cannot hope to win either happiness or success, even in a dream." Therefore, by us all, guru devotee disciple brothers, to annihilate mountainous obstruction, Brahmibhut Acharya Charan did, after earnest thought, made a decree, the very same we all should respect, together with faith and trust. Those people who today, for any reason or wish, are attaching any shortcomings to the conduct, reasoning in the mind of Acharya Shri, and them by means of useless gossip in relationship to the vasiyat, we should remain careful of them, whoever else they are, why not? When the time comes their own remorse will be. Understand that envy, malice, self-interest, political gambles, deceit and craftiness, move in the form of Narayana (God), sanyasi, in the field of mahatmas (great souls) are those showing increasingly to be trapped in worldly illusion. To us householder people having seen that, they are viewed with boundless amazement. Bhagwan give to us the gift of keen intelligence, protect the dharma, Bhagwan give to us the gift of keen intelligence, protect the dharma, erase adharma. Produce goodwill amongst living beings and universal happiness. This is really the request at the lotus feet of Shri Gurudeva. 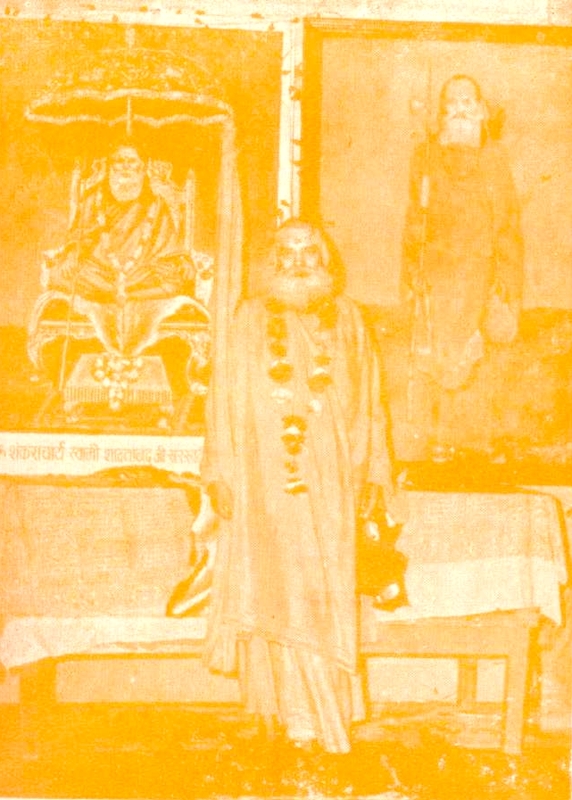 On 12th June 1953 Swami Shantanand was enthroned as Shankaracharya of Jyotir Math, but less than two weeks later, on 25th June 1953, Swami Karpatri established a Swami Krishnabodashram as another Shankaracharya of Jyotir Math. Apparently, Swami Krishnabodashram laid a condition that he would not involve himself in any legal disputes, and this condition was accepted, nevertheless, succession disputes erupted, which have dragged on interminably, for over half a century. The lineage of Jyotish Peeth (also known as Jyotir Math and Jyotirmath) has been contested by Swami Swaroopanand Saraswati, (Shankaracharya of Dwarka since 1982). Further information about the death of Swami Brahmananda, the making of his Will, and the succession disputes, is included in 'Dandi Swami', a book by Paul Mason, compiled in celebration of a disciple of this lineage. This above article from 'Shri Shankaracharya Upadesha' newsletter was translated from Hindi to English by Premanand Paul Mason, April 2011, with thanks to Anil Ray for sharing his preliminary translation work and to Declan for his support and encouragement. Thanks also due to Dana Sawyer for sharing his helpful contact in Kashi, who found me this copy of the'Shri Shankaracharya Upadesha' newsletter.